Honeywell introduced its new INNCOM Elements line of guestroom controls and wired devices for hospitality customers. Elements beautifully styled thermostats, switches, sockets and modular products showcase designer-inspired colors, materials and finishes to complement a wide range of possible guestroom designs. The distinctive Elements collection is inspired by materials such as wood, leather, and stone. Each Elements switch may be tailored to specific design requirements with 16 high-quality finish materials and a range of guestroom functions with intuitive icons. The Elements line of touch controls delivers an attractive harmonized appearance for Honeywell’s INNCOM guestroom controls, and for PEHA and MK Electric units based on regional requirements. These three types of attractive wall-mounted Elements interface plates complement guestroom design as stylish accessories and make them a perfect companion for any interior, while also providing control of guestroom automation and comfort systems. Honeywell’s INNCOM Elements system is part of the most collaborative room automation platform in the world. Honeywell offers integration capabilities with multiple electronic lock manufacturers, dozens of HVAC equipment manufacturers, in-room guest services providers, hallway signage and wall plate designers, drape and shade controllers, and much more. Honeywell understands that making the systems work together seamlessly is the foundation that enables forward-looking hoteliers to deliver memorable guest experiences while running their property efficiently. The Elements Thermostat is easy to use for guests and staff. Its large backlit display gently glows when not in use, but instantly illuminates upon being touched to show room temperature, set temperature, fan speeds and other information. The display is equipped with simple-to-use icons that are easy to understand regardless of your native language. With its ancillary sensor capability, this intelligent device is capable of serving as an information gateway to multiple systems. When coupled with the X47 HVAC controller, a euro module or ceiling mounted motion sensor or other devices like the Elements Key Card Reader, the Elements Thermostat becomes part of an intelligent room automation system capable of providing energy management and reducing utility expenses. Elements Switches are beautifully designed with easy to use interfaces that control lighting, drapes, and other amenities. They are available with an up to six button keypads or with two or more dimmers in combination plates that provide AC power, USB charging, and audio/video connectivity with guestroom controls. Elements Switches are a stylish, easy to use and flexible interface to a guestroom’s integrated functionality. The Elements system may also be connected to INNcontrol3 energy management via INNCOM’s Deep Mesh Network (DMN) as part of a centrally controlled energy management system (EMS). Elements enables property managers to view real-time room status information, room and property energy trend data, alarm reports for malfunctioning equipment, instant control of temperature setback parameters, and other online diagnostic and preventative maintenance functions. The Elements system can communicate with other hotel server-based systems, such as Property Management Systems, Building Automation Systems, Central Electronic Locking systems and many others through the DMN. 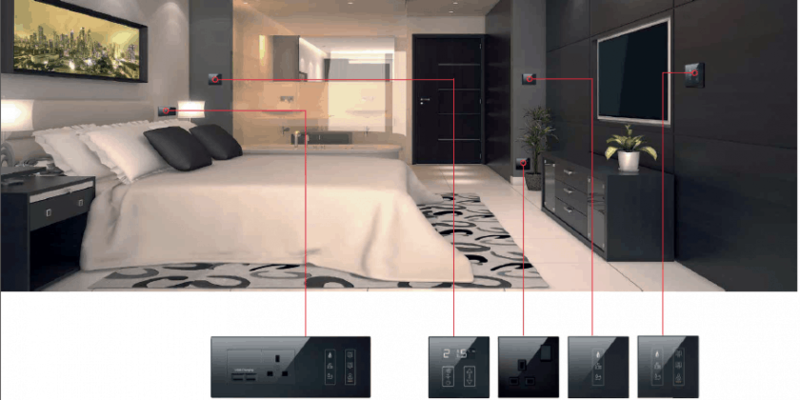 HONEYWELL INTRODUCES INNCOM ELEMENTS — DESIGNER GUESTROOM CONTROLS FOR HOSPITALITY CUSTOMERS 0 out of 5 based on 0 ratings. 0 user reviews.